Overall economic, as well as EPS, growth is and is expected to remain quite solid. It is very likely not going to be as strong as we were expecting at the beginning of the year, but still decent enough to be a support for equity markets. Low rates in developed market economies are keeping US long rates at unusually low levels given the US economic outlook in terms of growth, inflation and budget deficit. Weaker growth dynamics in Europe and Japan are possibly a blessing in disguise. The growth dynamic is slowing across the board in the emerging world. Tension is now palpable as uncertainties surrounding the economic outlook in emerging markets and, to a lesser extent, Europe and Japan have grown. Being in the firing line of sheriff Trump makes investors uneasy and it is hard to gauge the resilience of these economies in the face of the potential trade impact. These concerns have thus continued to hurt sentiment. In the meantime, overall economic, as well as EPS, growth is and is expected to remain quite solid. It is very likely not going to be as strong as we were expecting at the beginning of the year, but still decent enough to be a support for equity markets. However, investors should now also recognize that the great inflation scare that would have pushed rates much higher and potentially led to a meltdown of bond prices and, through a ripple effect, of some stretched-to-lofty valuations in risky assets hasn’t really materialised. Inflation isn’t roaring back, Fed rate hikes have been clearly telegraphed for the next six months and the ECB and BoJ have dashed expectations of any significant monetary policy tightening in the near future. So, the music hasn’t completely stopped yet: low rates in the rest of developed market economies are keeping US long rates at unusually low levels given the US economic outlook in terms of growth, inflation and budget deficit. And, as usual, the US is the main beneficiary of this scenario of strong domestic - and somewhat insulated economic growth - and low global rates in developed economies. At this point, like bounty hunters, we believe that the bravery to chase improved equity risk premia by upgrading our risk stance by a notch will be rewarded going forward. Bravery isn’t expected to rhyme with genius or boldness: so we will be boring by adding, across the board and without any sectorial tilts, to US equities. Happy ending or not, the US market always wins. Amid a softer global growth dynamic halfway through 2018, the United States carries on displaying insolently strong economic momentum. However, while having its largest economy thriving is usually good news for the rest of the world, this time the US’ strength may well be a poisoned chalice for the global economy. The United States’ endogenous and self-fulfilling combination of an improving job market and investment spending, tax cuts and rising short-term rates is very much at odds with economic dynamics across most of the rest of the globe - and this divergence has already caused some damage, especially in the emerging world. Protectionism and the prospect of a possible large-scale withdrawal of the US from the global trade arena risk amplifying this trend and could possibly Make America Great Again … at the expense of the rest of the world. Indeed, the United States may currently be, at the same time, the Good, the Bad and the Ugly of the global economy, depending on whether you look at its positive growth dynamic, its damaging monetary policy spillovers to the rest of the world, or its uncooperative trade policies. Nevertheless, weaker growth dynamics in Europe and Japan are possibly a blessing in disguise. At a time when the Fed is firmly set on normalising its monetary policy, softer business cycle and inflation dynamics in Europe have led to the ECB playing down concerns of a rapid monetary policy tightening in the Eurozone, while the Bank of Japan shows no sign of appetite for altering its existing accommodative stance. Such desynchronisation from the Fed rate cycle and the visibility provided at least till the end of this year, even if the fruit of disappointing economic data, may paradoxically act as a welcome tailwind for the global growth outlook in the coming months. "You see, in this world, there’s currently three kinds of economies: the one that thrives (the US), the ones that muddle through (Europe, Japan, East Asia) and the ones that struggle. Emerging economies with external deficits struggle." "There are two kinds of economies in the world: those without inflation (developed economies) and those who have to fight it (emerging economies)." "In this world, there are three kinds of central banks: those who must stay easy (ECB, BoJ, SNB…), those who can hike rates (Fed, BoC…) and those who have to hike rates. Several EM central banks have to hike." The United States may currently be, at the same time, the Good, the Bad and the Ugly of the global economy. There is no rest for the US economy: it keeps growing at a fairly strong pace and firing on all cylinders in terms of household consumption, business investment and public spending. Moreover, the possibility of another round of tax cuts before November’s Mid Term elections counterbalances any potential loss of momentum in H2 after the H1 "sugar rush". In such a context, the message conveyed by the Fed in June was unambiguously positive and clear: unless there is a major downturn, the Fed will stick to its normalisation path, raise short-term rates by 25bps per quarter and keep letting its balance sheet deflate as QE-purchased bonds mature. How could it do differently when the central bank just revised up its GDP growth projection, expects the unemployment rate to reach a multi-decade low and sees inflation finally settling just above its 2% target? On this side of the Atlantic, there is now a similar degree of visibility on the monetary policy outlook, but this is about the only similarity with the US. Indeed, growth momentum in the Eurozone has constantly slowed down in the first half of the year and underlying inflationary pressures remain subdued at best. If a stabilisation in growth is expected in the coming months based on resilient domestic demand, global trade tensions and tariff threats will continue to weight on export-sensitive industrial sectors. Faced with this environment of a positive but softer growth dynamic and rising downside risks (not to mention political risks in Italy), Mario Draghi performed another balancing act. 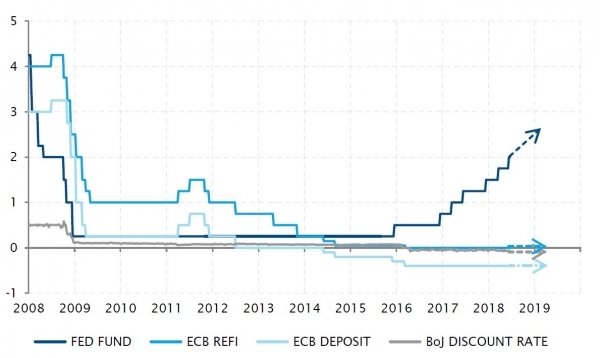 The ECB formally stays on the monetary policy normalisation path, based on a reaffirmed constructive economic outlook, but downside risks and uncertainties lead it to set an extremely cautious timeframe for this normalisation: a likely (but not certain) end of QE by year end, and a first rate hike pushed forward beyond mid-2019. The underlying idea is clear: the ECB consciously leans on the side of caution and wants to maintain very accommodative financial conditions until it has more confidence that nothing will derail the ongoing Eurozone expansion. 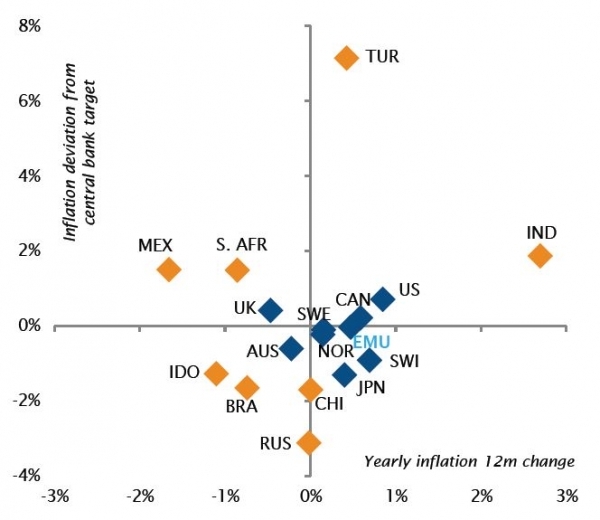 This picture of softer growth/low inflation implying accommodative monetary policies for longer characterises not only the Eurozone, but more or less the whole (ex US) developed world, including Japan and Australia. 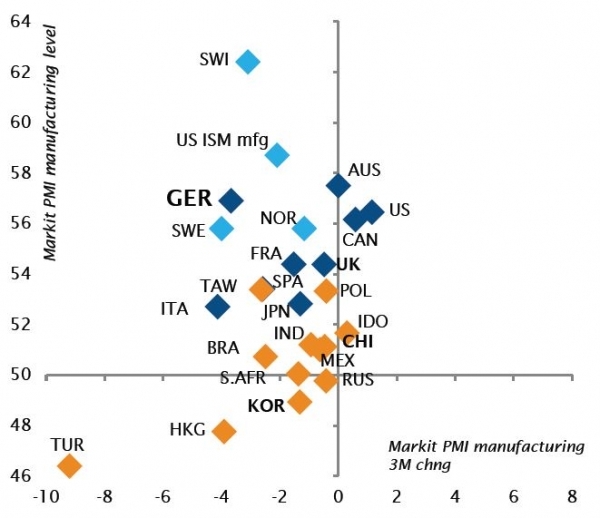 The growth dynamic is slowing across the board in the emerging world. In China, concerns around the impact of US trade tariffs on export-related industries are coming on top of an already softer domestic growth environment. However, Chinese authorities have the tools to manage such headwinds up to a certain point, by pulling on the levers of monetary policy (that has become decidedly accommodative recently) and FX policy (with a 5% depreciation of the yuan vs the USD in two months). On the contrary, the general monetary policy trend across EM is directed toward tighter credit conditions in order to contain currency depreciation and resulting imported inflationary pressures. Rate hikes in Turkey, Indonesia, Mexico, India, or the end of the easing cycle in South Africa, Brazil or Russia are all testimony to the change in the emerging market macroeconomic backdrop triggered by the Federal Reserve’s monetary policy tightening and its impact on economies reliant on USD funding. Uncertainty over trade wars and European politics has clearly unnerved markets in recent weeks, triggering a mild market correction in US equities and a somewhat more pronounced selloff elsewhere, particularly in emerging markets. Yet the overall picture remains unchanged, as the global economy continues to be in the late stages of a goldilocks scenario, where risks to economic growth and inflation remain muted. Moreover, central banks have once again reaffirmed their monetary stance, with the Federal Reserve continuing its rather hawkish narrative, which is largely reflected in market expectations, and the ECB remaining ultra-accommodative. With this in mind, the recent weakness appears to be more a buying opportunity than anything else. Hence, the risk stance was upgraded from mild preference to preference, while the stance on portfolio duration remained unchanged. While the world ex US has broadly gone sideways in terms of earnings revisions, the US has seen a sharp increase in earnings revisions, last seen in in 2009-2010 after the global financial crisis. While the rationale for the upgrade in our risk stance was to harvest the equity risk premium, this upgrade in risk is not meant to come with a great deal of directional bets. 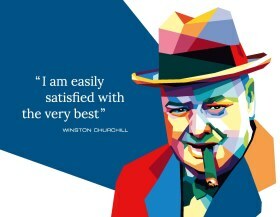 Our focus is more along the lines of creating a better balanced, more "boring" asset allocation. This has manifested itself already in the last few months with the inclusion of for instance pharmaceuticals, a defensive high-quality industry in the more cyclical sector mix. Last month’s upgrade of US equities is also a testament to this. Then, the upgrade was predicated on the relative resilience of the US economy compared to other parts of the world, potential tailwinds from a weaker US dollar, and some improvements in valuations. This month has seen a further upgrade in US equities, which is still predicated on the aforementioned points. Yet making the US the single most favoured equity market requires some deeper explanation. After all, the US is more expensive than the rest of the world. Looking at Factset data, the US trades on a more than three-point premium to the rest of the world in terms of 12 month leading PE ratios. Yet when looking at the PE to growth ratio, the valuation difference between the US and the rest of the world has narrowed substantially over the last few month and is by now valuations are almost at the same level. It is all about differences in relative expectations for earnings growth. And indeed, when looking at the evolution of analyst earnings revisions, there are clear divergences. While the world ex US has broadly gone sideways in terms of earnings revisions, the US has seen a sharp increase in earnings revisions, last seen in in 2009-2010 after the global financial crisis. A big part of that has to do with the corporate tax reform in the US, as well as the ongoing deregulation, which will in our view continue to provide a favourable backdrop for corporate earnings going forward. Because of that, the US has once more taken on the role of a defensive market within the context of a portfolio. Besides Australia, Canada and Japan, it offers the lowest risk contribution in the context of global equity markets. For an EUR investor, a fully FX hedged 5Y Brazilian bond yields approximately 5.2% - this is a very good level given that the overall duration of such a position is 3.5 years. While the broad picture has remained unchanged, Italian nominal government bonds were upgraded by one notch to a mild dislike on valuation grounds. The same is true for European high yield bonds, where namely subordinated bank debt has seen a substantial improvement in valuations. There has been no change in stance towards emerging markets, despite vastly improved valuations. Recent months have brought a toxic mix of a rising USD and rising bond yields, which have pushed emerging market debt yields up significantly. While we don’t expect a repeat of 2013 and the "Fragile five", we believe it is too early to change our assessment. Having said that, there are interesting low-risk opportunities opening up in the EM space. Brazil is a good example of that. Brazilian local bonds have been a well-orchestrated investment theme and widely held by investors in recent years, but investments are generally created by taking on a great deal of FX risk. Up until six months ago, owning FX risk was the only way to access the high yield levels Brazil has to offer. However, persistent interest rate cuts by the central bank has brought the FX hedging cost down by a significant degree. At the same time the Brazilian yield curve has risen in absolute terms but remained fairly flat, allowing investors to access comparatively high levels of carry without taking much duration risk. For an EUR investor, a fully FX hedged 5Y Brazilian bond yields approximately 5.2% - this is a very good level given that the overall duration of such a position is 3.5 years. The upgrade in risk implies a downgrade in our preference for cash, otherwise no change in assessment.